The Bizen Area is home to such sites as Okayama Castle, which was built by the feudal lord Hideie Ukita, and Okayama Koraku-en, which is famed as one of the Three Great Gardens of Japan. 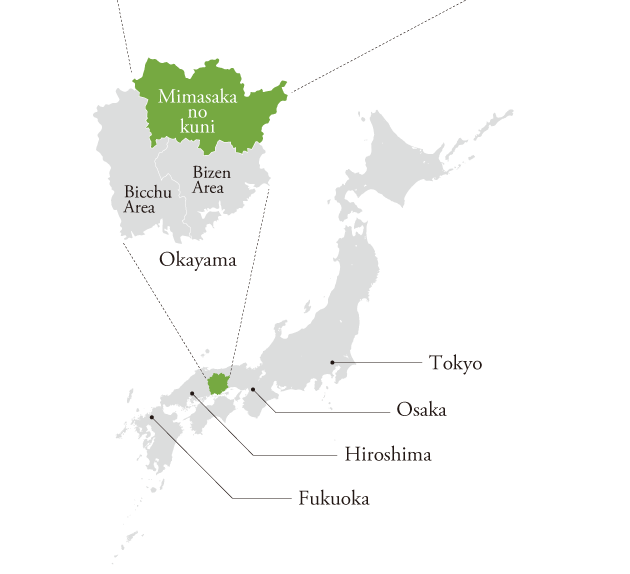 The area is also known for excelling in arts that draw upon the elements of earth and fire, including Bizen ware pottery and the Japanese swords crafted by the master swordsmiths of Bizen Osafune. In addition to its rich living history and traditions, the Bizen Area is also blessed with the bounty of delicious seasonal fruits as well as seafood from the nearby Seto Inland Sea. Known for its traditional townhouses and white-walled storehouses, the Kurashiki Bikan Historical Quarter is an area where you can encounter beautiful scenery that seems to transcend time. The Bicchu Area is also home to the Tsukuriyama Kofun Tumuli and Ki Castle, sites where you can explore the mysteries of the ancient Kibi Province. 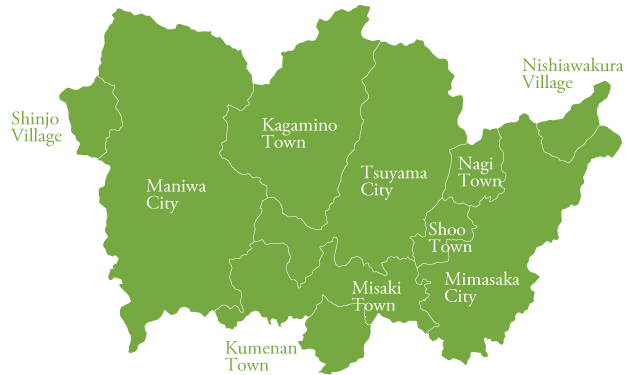 The Kojima area of Kurashiki City and Ibara City are known as the birthplace of jeans in Japan, and the area remains a major producer of jeans to this day. Specialties include Kumazasa udon noodles and “Hime no Mochi” (mochi = pounded rice cakes) as well as various foodstuffs made with “Hime no Mochi,” such as “Genki Okaki” (okaki = fried mochi). Specialties include famous sweets and specialties from Okayama and Tottori, as well as local farmed and wild vegetables and burgers made from local ingredients. Specialties include black soybean soft serve ice cream, rice flour bread and “Fresh from the Garden” ToreTore Bento made with fresh-picked vegetables. Specialties include soft serve ice cream, taiyaki and other sweets at the restaurant Sakura as well as yokan (sweet bean jelly) and grapes. Specialties include Hiruzen yakisoba noodles, soft serve ice cream, Hiruzen white radish and wine made from wild grapes. Specialties include soft serve ice cream, cheesecake, yogurt and other dairy products from local Hiruzen Jersey cattle. Specialties include handmade miso, sweet natto made from black soybeans, mochi (pounded rice cakes) containing black soybeans and KokuKoku black tea. Specialties include black soybean soft serve ice cream, katsudon (fried pork culets over rice), oyakodon (chicken and egg over rice) made with local Okayama chickens and chirashi (scattered) sushi made with black soybeans. Specialties include jumbo bell peppers, foodstuffs made with plums, Japanese yams and Tsuyama Offal Udon Noodles. Specialties include fresh flowers and vegetables, handicrafts, foodstuffs made with Hime chili peppers and Kagamino inaka (country-style) curry. Specialties include foodstuffs made with local citrons, including ice cream, madeleine cakes, dorayaki and citron croquettes. Specialties include New Pione grapes, pears, black soybeans, rice from the terraced paddies, asparagus, tomatoes, leeks, shiitake mushrooms (dried, freshly cultivated, thick type, etc. ), miso and double-yolk eggs.